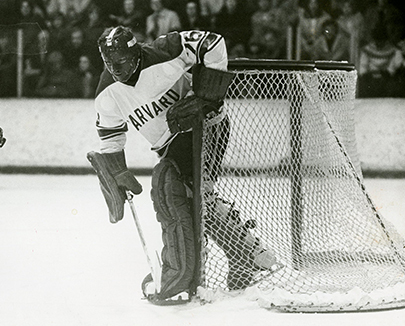 One of the most outstanding goaltenders in Harvard history, Brain enjoyed a career highlighted by awards including a first team All-American selection in 1975, first team All-Ivy recognition in 1975 and 1977, and the 1977 Beanpot MVP trophy, which he won by out dueling future Olympic hero Jim Craig. Brian recorded a school record 650 saves in the 1975-76 season and led his team to a watermark 23-6 season in 1974-75 and two Ivy titles. When I began thinking seriously about colleges as a high school sophomore, I was fortunate to be pre-conditioned to high standards of athletic and academic as a student at The Hotchkiss School. Harvard was really the only choice in the end that fit and was a natural progression from Hotchkiss. From a hockey perspective, Harvard offered me one of the nation’s top programs and coaches in Bill Cleary, providing me with the opportunity to be the best I could be in my position even to where a professional playing career could be an option. Looking back, what may have been the most valuable part of my experience was the challenge of going from an NCAA final four team in 1975 to one which struggled to make the ECAC playoffs the next year and failed to the year after despite a Beanpot Championship while the mix of players changed dramatically. Lots of personal and team challenges, many highs and lows, yet Billy never stopped motivating me as a player or a person, always maintaining his incredible competitive juices which I’ll always believe will be his greatest gift to me. The personal achievements and awards notwithstanding, playing for Billy and maintaining that mutual respect and friendship over these past twenty years coupled with being able to wear the same uniform that fellow Hall-of-Famer Bruce Dumo and thirty-four other Hall-of-Famers have worn so proudly remain very special. When we were asked also to describe how out lives have been affected due to our participation as Harvard university athletes, for me it’s simply “in every way.” I’ve been fortunate to have remained involved with hockey since graduation working with players, coaches, administrators, referees, and parents at all levels from all over the world and today reap the rewards of seeing my six-year-old son playing the sport (with a vengeance!). And, most importantly, my Harvard career even played a part in meeting the former Sara LeBlond ’82 (a pretty fair Harvard athlete herself), now my wife of fourteen years and mother to our three wonderful children. To be recognized tonight as one of the best in my sport and join thirty-five other former hockey greats is really a dream come true.